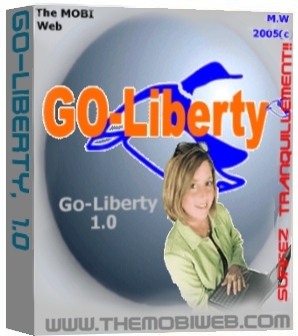 Go-Liberty software protects you and helps you to surf the Internet, download, chat without being tracked and keep your online activities private. With Go-Liberty, protect your personal information, IP address, credit card numbers and geographic location from online snoops. Protect your computer from hackers and spammers. Go-Liberty is compatible with all the navigators, peer to peer, FTP clients, chat software, etc. 100% anonymous surf guaranteed. Go-Liberty creates an encrypted path between your computer and the Internet to shield you from the most sophisticated methods of online spying and snooping. The software connects your computer to the Internet via secure gateways. This way gives you the entire control about the path used in your internet connection and data transfer. Your identity and IP address is totally hidden, you can so surf, download, chat and make any Internet activity in a total security and without any risk. Go-Liberty is very easy to setup and use. It can works silently in the background without slowing down your Internet connection and this thanks to the ability to change your own virtual IP address. At any moment, you can enable or disable the anonymous surfing and change, when you want, your IP address. Only the chosen IP address (of the virtual server) will be communicated when your Internet connection is activated. Take a profit from the new version 1.1 of the software that contains much of new functionalities for the protection of your privacy: Automatic update of the used virtual servers in order to accelerate the connection, use and define your own proxy, delete your trace on your computer, delete your Internet navigation traces, your cookies, navigation history, Internet temporary content, etc. Employee Desktop Live Viewer caters the employee monitoring need of large IT organizations. It helps in monitoring employee activities from the main computer of a domain or workgroup network. PC monitoring tool provides complete solution to track activities of computers remotely and helps in increasing productivity of the organization. The Privacy Photo Album utility is designed for anybody who is looking for a most useful and powerful image encryption software which can encrypt private pictures. Nobody will see content of photo albums even he(she) steals them from your storage. Smartcard Logon to Windows Machines - without the requirement of a domain controller! Supported Token: Smartcard, USB Memory Stick, Memory Card, Mobile and more. This site does not contain serial number, crack, keygen Go-Liberty serial number : serial number is the simplest type of crack. A serial number(cdkey,product key,etc) is register the program as you may already know. a crack or keygen may contain harmful software. If you cannot find the exact version you want, just give it a try. for more information read .nfo/.txt/.diz file include in zipped file.